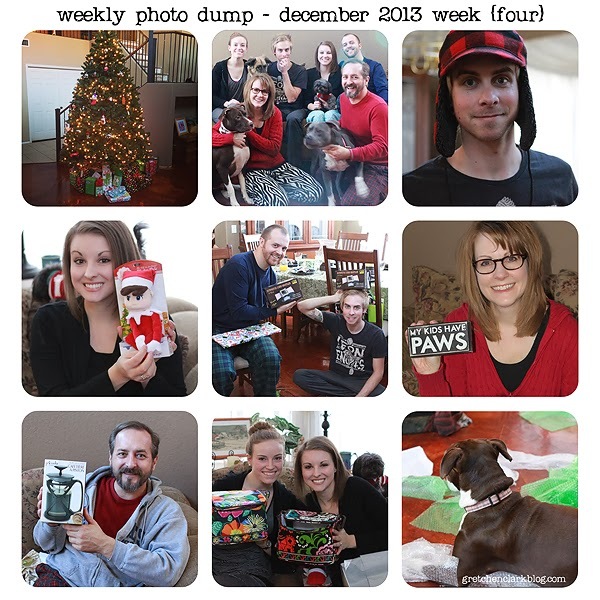 The Clark Christmas Edition photo dump (these photos will probably show up in a future post of my Project Life layouts!!). 1. Our Christmas tree was (finally) put up a few days before Christmas, I was so behind schedule this year! 2. One of the out takes from our family Christmas photo...I was really hoping to get one with all the dogs~it was quite the task, better luck next year!! 3. Josh with one of his stocking stuffer's. Cause you need a warm hat in AZ (it is supposed to be 77 degrees on Friday)!! 4. Ashley was talking about wanting to do "Elf on the Shelf" next year. So I got her one, I don't really like the original one (it gives me the creeps!! ), but this guy was cute! 5. Nate and Josh got matching card shufflers~which they were pretty excited about! 6. My mom gave me this plaque, which I LOVE!! 7. Mike with his new coffee press, which he is enjoying EVERY morning. He even wants to get one for work. 8. Vera Bradley lunch bags were a popular item this year. 9. Sophie enjoyed popping the bubble wrap~silly pup!! TFS. Looks like everyone had a nice Christmas. Happy New Year!